The two interconnected muscles found on our neck combined to make the bulkier sternocleidomastoid muscle (SCM), which allow our neck to turn and rotate the head in either direction. These bands of muscles are formed behind the ears and moving down to the frontal aspect of neck. One band is attached to breastbone and the other one is attached to the collarbone. What Are the Symptoms of Sternocleidomastoid Pain? Tension headache: Headache caused by the persistent state of tension in the muscles of neck and cranial region. These headaches can lasts for up to half an hour or few days. Migraine: The SCM can also cause migraine attacks that are characterized by disturbance in the visual acuity, muscle tenderness and headache. Hangover headache: The SCM trigger points can be activated by consuming too much alcohol. In addition, your dreaded headaches can also be due to trapezius muscle involvement. Atypical facial neuralgia: The atypical facial neuralgia is characterized by pain in jaws, temple regions and cheeks. Swelling, pain and soreness in throat: On the tongue base, you may feel pain with difficulty in swallowing food. This is due to the involvement of sternal division trigger points. Disturbance in vision: Sternal part's trigger points can make your vision blurry, doubled or dimmed. Eye issues: Drooping eye lids, tearing and redness in eyes are also some classic symptoms of SCM pain. 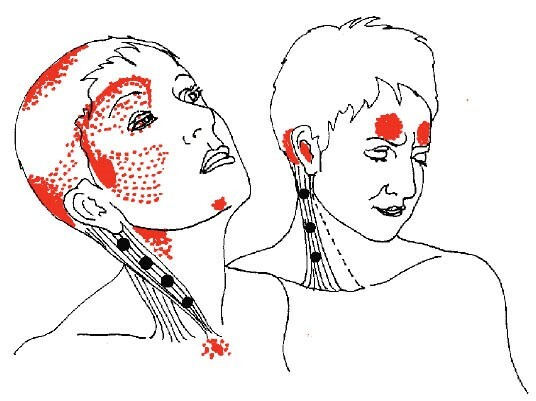 Forehead sweating: Unilateral sweating of forehead is also a common symptom of sternocleidomastoid pain. Dizziness and unsteadiness: Dizziness on head movement, car and sea sickness along with fainting and nausea on moving head. Hearing disability: Ringing and deafness in any of the ears can be caused by the involvement of clavicular division triggers. Sore neck: The soreness in neck is caused by too much rubbing on the area. Pain in upper chest: Pain in upper region of chest bone. Stress to the SCM: The pain is mostly caused by the stress over the sternocleidomastoid muscle due to activities like looking up for a long period of time, painting upwards, strokes of swimming, wearing a tight tie and horse riding, etc. Poor postures and especially bad head postures can also cause pain in SCM. This poor ergonomics include reading in bed, sleeping with too many pillows, having the head turned at side or backside for long period of time. Sudden pulls or injuries to head, like whiplash. Breathing improperly can also lead to pain in sternocleidomastoid. Acute or chronic infections, like flu or sinusitis. Structural issues and balance keeping like leg length discrepancy. This can be easily done by yourself, use your thumb and forefinger to squeeze the muscle gently or you can also opt for a therapy by a masseuse. Trapezius muscle can help in stretching the Sternocleidomastoid muscle. To stretch right trapezius, sit and tilt your head to left, then bend more to left. While bending, place the right hand under the right hip. Keep tilted at left and fall the head forward. Turn face to left and pull left hand to head's right side for further stretching. For stretching of sternocleidomastoid, tuck your chin after rotating head to right side, your opposite sternocleidomastoid should feel the stretch. Individual muscles don't need strengthening, but the neck exercise can make all the muscles work properly. The pain in sternocleidomastoid can also be healed by pushing the head forward (the sternocleidomastoid function corresponds to flexion activity of neck). Place resistance by applying rotational force on the side of one jaw and then turning the head against resistance can also help. The hand or other means of resistance can be used. A cushion can be placed against a wall and then leaning against forehead to support body weight. Sternocleidomastoid pain can be eased by different kind of rubs such as penetrex. It provides cooling and warm therapy during the massage. General non-steroidal and anti-inflammatory pain relieving medications like ibuprofen, naproxen can be used to reduce the pain. Stand or sit straight while working: Posture is one of the biggest problems especially when one sits in front of the computer with the head projected forward. Instead one should stand and sit with the head erect. Nearsightedness can also be corrected in this way. Do not overload the shoulder: If you are reading on bed, make sure the light is straight above your head pointing to the reading material and not on the sides. Holding mobile phone with shoulder can also cause sternocleidomastoid pain; therefore, you can get earphones instead. Muscles can be overloaded by swimming due to breathing and turning the head. Keep the pillow in the right place: It's better to sleep with straight head and tuck the pillow ends in between your shoulder and chin. Make sure your pillow isn't under your shoulders. Side-lying sleepers should keep a pillow in between shoulders and head while sleeping. Why Do I Have Headache After Eating? Why Your Head Hurts Behind Your Left Eye? Why Do Your Fingers Twitch?